Isn’t such a bike tricky to ride? Most bikes* are relatively easy to handle, and with a little bit of practise you will forget about you’re sitting on a cargo bike. For example, I sometimes daydream about sitting on my trackbike instead and forget to put down my foot at the red light. Just because the handling of the Omnium Cargo is so sweet. To be fair, there are differences. 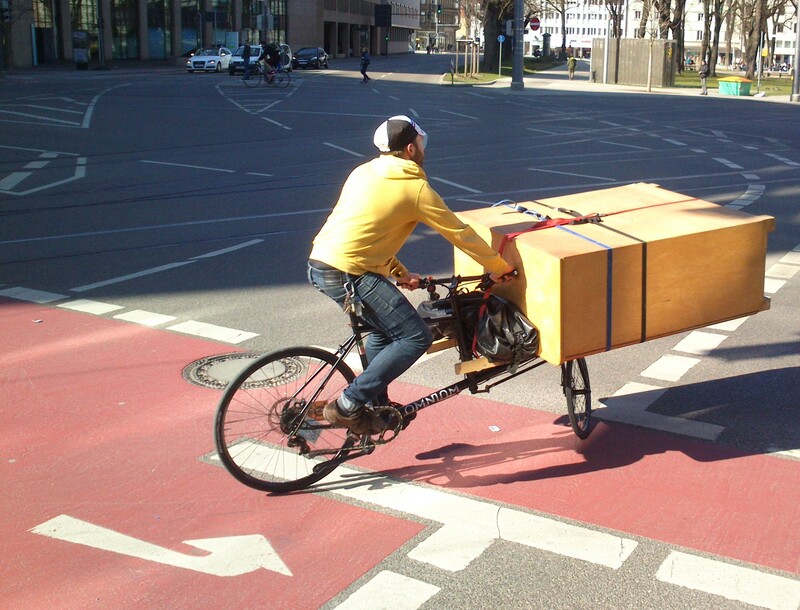 It depends on the kind of freight bike you ride. A Long John built cargo bike, carrying the load behind the front wheel, has a very long wheelbase, and therefore it will not be very agile. Long Johns tend to have a wider turning circle. Especially the Urban-Arrow has a very limitted steering angle. Sometimes this can be a bit annoying, but for it’s defense: with kids on board, you usually don’t do slalom races. It can be an issue though, when parking the bike, or turning it on limitted space. Here builts like our Taurus are more agile, as the wheelbase is only slightly longer than that of a usual bike. With heavy or moving cargo, like kids, a Long John cargo bike, like the Urban Arrow or the legendary Larry vs Harry – Bullitt, has the advantage of a low center of gravity, making it more stable to ride. With the Omnium though, heavy loads can be a bit challenging to handle, but isn’t that part of the fun? * MOST, not ALL: I rode a Babboe City once and was shocked, how flexible the whole construction was. With only 50kg in the box, I had quite a hard time steering it in a straight line. Hi, thank you very much for the post. I am in the nerve racking phase of choosing a family bike. I am 6 months pregnant and we have a 22 month old. I was between the Nihola (the only one I have and can actually tried), the Butchers and Bicycles and the Urban Arrow. The dealer helping me definitely thinks I should get the MK1-E and they say because it turns with you it is much safer. Your post cued me into the fact that I could not fit a baby in car seat and toddler inside. I called them (B&B) and they said for the toddler I can mount a car seat on the back until both ca ride in the bin (when baby is 1year). Since I have only tried the tricycle it felt quite stable, we have a lot of starts Since you have tried them all if you have a baby and a toddler would you take the electrified version of the UA the B&B or the Nihola? Thanks a bunch!!!! first of all congratulations for the baby! And congratulations for getting yourself a cargo bike. Your question might not be so easy to answer, as each bike is one of the best of its kind. The answer to your question which of the bikes to get, also depends very much on who you ask: Jess and I are different styles of riders with different comfort zones. I like riding fast and dynamic. I don’t care about bike lanes: I don’t mind riding in the street and demanding my space there. Also I don’t take the Kids as often as Jess does. Jess likes bike lanes and the potentially safe environment they provide. She’s not a big fan of rolling in traffic with cars around her and is not keen on the hassle it can be. Tricycles need more space. So if the local infrastructure doesn’t provide spacious bike lanes, you might sometimes be forced on the street (let’s not ride on the sidewalk, annoy pedestrians and stress the image of the reckless cyclist 😉 ). Therefore she likes a bike, that rides like an actual bike and takes up only a „bit“ more room. From a daily riding mom’s perspective Jess will most definitely recommend the UA. She does not see any increase in safety offered by the third wheel and has quite some practical points that speak for the UA. Easy picknick packing. Easy swim day packing. Easy last minute anything packing! She wouldn’t like being on the Butchers & Bicycles with one kid in the box, one behind her in the rain, while the bike-lane narrows down to the frontwheels’ track-width.